All through Oriel Arts Week 2015, we’re providing a daily shot of musical inspiration to set you off to a good start! Make sure you come back daily for your music recommendation & explanation provided by Oriel College Music Society members. 14th century song does have the potential to sound pretty dry and something so far estranged from us today that it can only be appreciated by academics who can decode it with their special 14th century French music enigma machines. In fact, I thought just that before starting to learn about Guilliame de Machaut, a French composer and poet who lived through the best part of the 14th century, but then I listened to some recordings of his output. Whilst some of it is a bit uneasy on the ears and is hardly anyone’s jam, I discovered his virelai (song) Douce Dame Jolie and it has become the tune to which I conjure up motivation to work in the morning and even to get me going with tidying my room. Yes, really, it is that hip. When you dig a bit deeper beneath the immediately pleasing surface of Douce Dame Jolie (sorry, allow me to get my special 14th century enigma machine out… *heave*) we learn a lot about why Machaut chose to make it so catchy. The song form’s name, ‘virelais’, is derived from the French verb ‘to turn’. 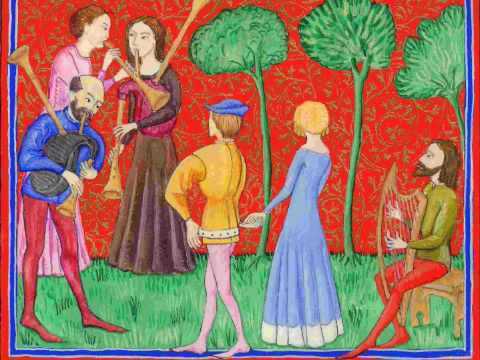 This song is designed to be danced to and this is hardly a surprise as Machaut was a Court composer. The refrain ‘Douce Dame Jolie etc’ opens and, by its very nature returns, embedding itself as only a true ear worm would. Sadly this Youtube version is in English and lacks the drive and energy that my ‘go-to version’. If you have Spotify, I recommend listening to ‘Misericordia’s version. Keep following The Poor Print for your daily shot of music recommendation! Provided for you by Oriel College Music Society!